It was not hard to find Kadikalesi or Gumusluk and within minutes of being in the area, you could tell that the man-made, money-making machine of Tourism in Turkey had completely passed them by. I have since checked some of the major tour operator’s websites and these two places are hardly mentioned. If you are a holiday maker that wants your English breakfast and to be entertained on karaoke machines at night time, these places are definitely not for you. 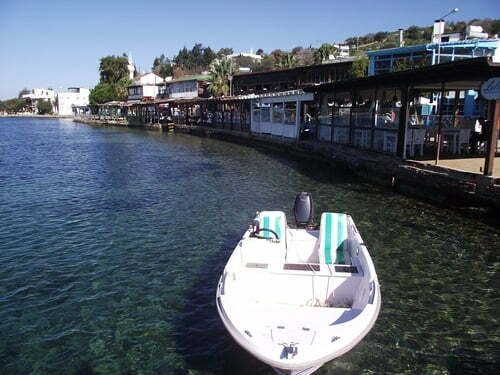 Stick to the center of Bodrum or Gumbet where you will probably find tourists are treated better than the locals. However if you are looking to discover a coastal resort of Turkey that does not have two faces, then head to these two resorts. If you are wondering what I mean by two faces, it refers to a saying of mine. 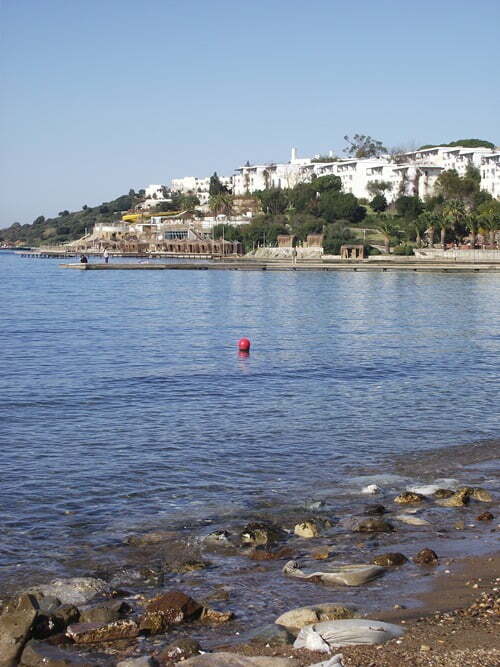 In many touristic coastal resorts of Turkey, there are two faces. The first is the tourist face. Life is idyllic and you wonder why everyone is not living there because it really does sound like paradise. Politics, religion and money are never discussed and no one has even heard of Prozac, let alone considered taking it. Then there is the true way of life which you get to discover when spending a lot of time in a place. You learn that it is just like every other town or city on earth and locals have their worries while councils fret about being voted out at the next election. Neighbors argue with each other and children swear their parents are old fashioned and just don’t understand them at all. While in Gumusluk and Kadikalesi, you will see instantly that these resorts are not part of a façade that makes Turkey out to be a one way ticket to paradise. 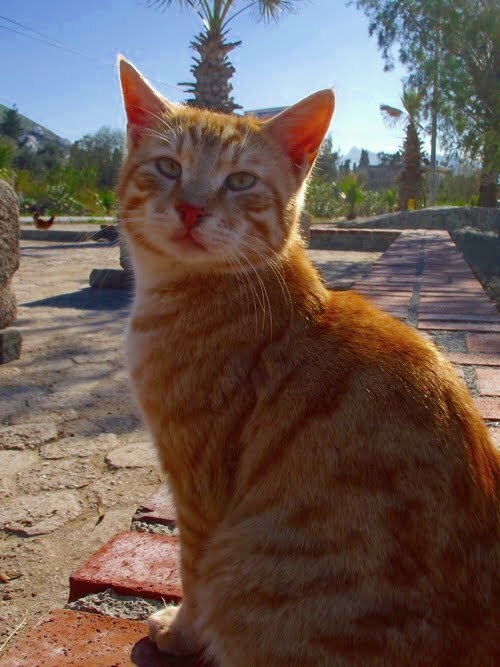 At this time of year you will not win a game of spot the local, in fact we attracted more attention from cats and dogs, posing for a photograph than we did from any human being. However I have heard in summer time it does attract a few Turks. The point is however, Kadikalesi and Gumusluk are the perfect prescription for anyone needing to recharge their batteries, gain inspiration or simply wishing to take a step back from life to assess their role and place in the big wide world. The two resorts have been forgotten by the “churn you in” and “churn you out” conveyor belts of the tourist companies and in my opinion that is not so much of a bad thing. 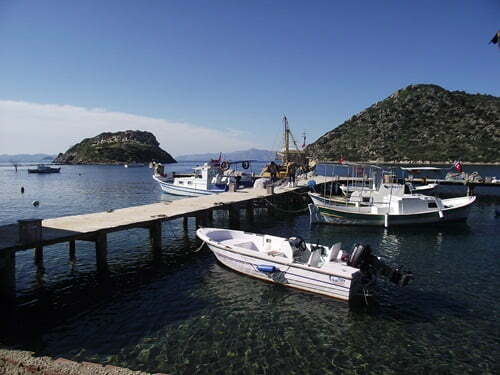 The two resorts are between Turgutreis and Yalikavak and you can get a small bus from either resort which will take you there within twenty minutes. If driving by car, just follow the coastal roads and signs will appear. 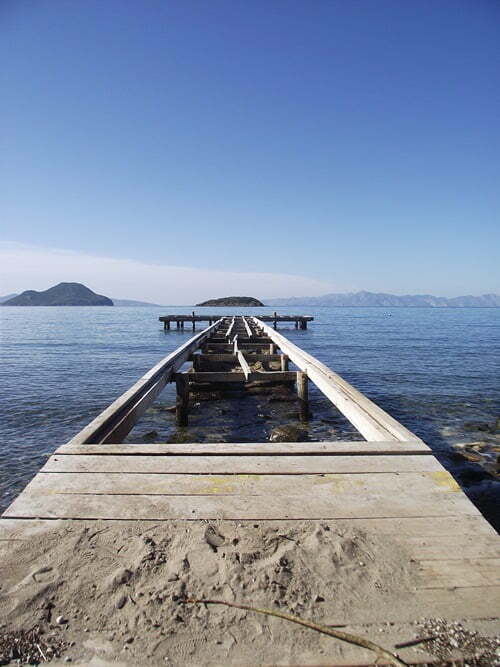 You may struggle to find a choice of accommodation however both resorts can be explored in a day, and accommodation is plenty in the neighboring resorts of Turgutreis or Yalikavak. We have a house near Gumusluk for the past 11 years and go there twice a year, May and June then Sept and October, August is too hot and the richer Turks from Istanbul are there then and it gets hectic. The best fish restaurant there is Karafaki owned by Mehmet! Not the place for kids to stay,but they would enjoy a visit,there is a sports hotel at the far end of the bay which might suit. Kadikalesi we only stumbled on this place as we had to have a meeting with someone there for breakfast,we allways have passed it on the way to Turgetreis and never bothered to stop,, they have a few nice restaurants there and a nice bakery/cafe. I want to revisit Mary because think my last visit was too rushed. Hi I love Gumusluk, we have a house here and yes its a perfect get away from it all location. Love the photos, heading there this June. Hi Barry, I saw a mini market. It was winter time when I went and the restaurants looked closed but I should imagine they are open in the summer. minimarket for supplies. Did you notice any? There are some really ancient paths around Gumusluk, winding through magnificent old Evergreen Oak’s. David – if I look back, I think I may have rushed my visit to Gumusluk – I would like to return as still have that feeling that I did not quite fully appreciate it. Perhaps return in the height of summer and get to know the locals more. Thanks for the tip about the beach, that sounds like an interesting place to get to work with my camera! I agree with you that Gumusluk may be too quiet for teenagers. However, for a really laid back on the beach type holiday there is nowhere better. 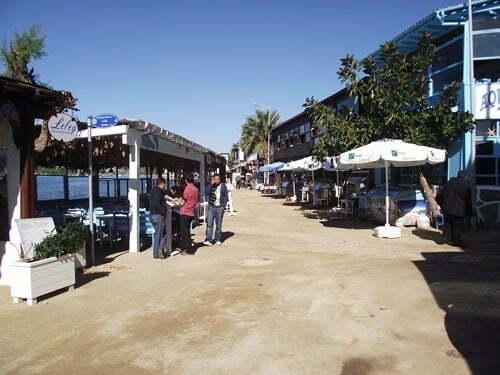 Your photo’s show the quayside and fish restaurant’s reached by turning right at the bottom of the hill but turn left and walk along to the other little beach where there are sunbeds and more intimate restaurant’s and the atmosphere is even more relaxed. Most of these restaurant’s have apartments above them and are situated in old fishermen’s cottages that are small and still very atmospheric. 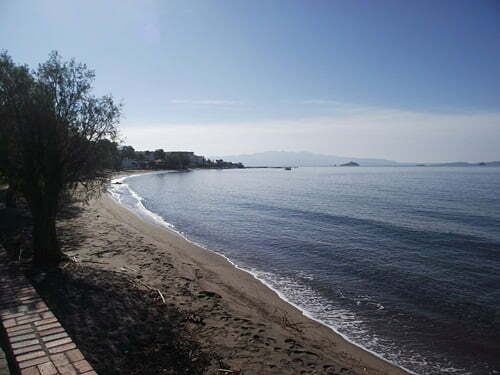 The entrances literally open onto the beach and are no more than 3- 4 metres from the waters edge, you can go to sleep with the sound of the waves lapping on you doorstep and nothing else to disturb your dreams. There are strict planning restrictions in place for Gumusluk as the whole area is an archaeological site and the remains of the ancient city of Myndos are everywhere in the surrounding countryside. 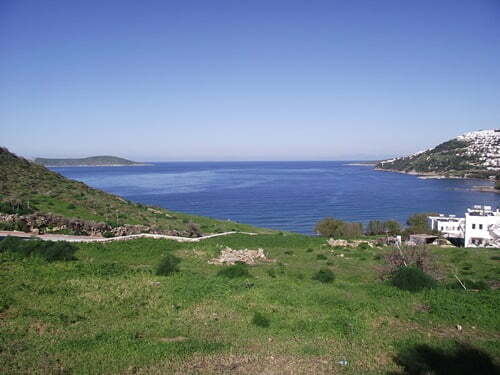 Myndos is where Cassius and Brutus fled and laid low for a year following the assassination of Julius Ceaser. Hi Wendy, I only spent a day in Gumusluk but I would not say it is a resort that caters for children. Your hotel is sure to have a swimming pool but I didn’t spot any water spots for the kids on the beach. For the weather at the end of June, I think your kids will be fine as it is not until late July or August that the heat really kicks in. 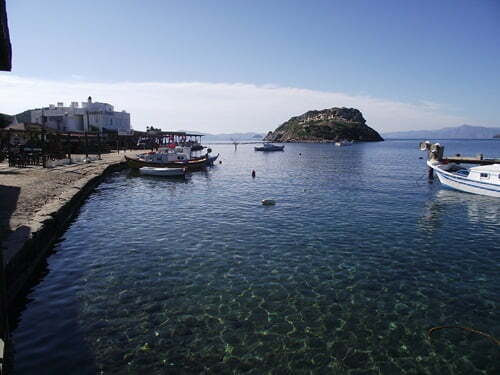 Perhaps have a look at Turgutreis instead. Ayak is another Turkey blogger and she lives on the Bodrum Peninsula so maybe she will be along soon and able to give more advice. would you say that Gumusluk would be a good place for a family to stay at the end of June? We have 3 children, two boys ages 15 and 13 and a daughter age 10. Our children are very active and adventurous. They love swimming pools, oceans, boogie boarding, exploring interesting sites. I am concerned about the heat….and am thinking of staying in an area where we can go out on gulets. Great Blog on Gumusluk and Kadikalesi. I used to live in Gumusluk for about 5 years. Loved it sooo much! The place is at its best in May, June, September and October! Its so nice to spend time with the locals during these months. However July and August become really busy with the Jet set from Istanbul. Its still a great place then, but not quite what it used to be like! Kadikalesi is brilliant too! Me and a couple of friends set up a windsurfing centre there. Its such a good place and the people are lovely. We can hassle him in May to take you heather. Girls against him! these piccies are amazing, & looks like the kind of places I’d love Ian to take me. Hi Duane, Glad you loved the photos. 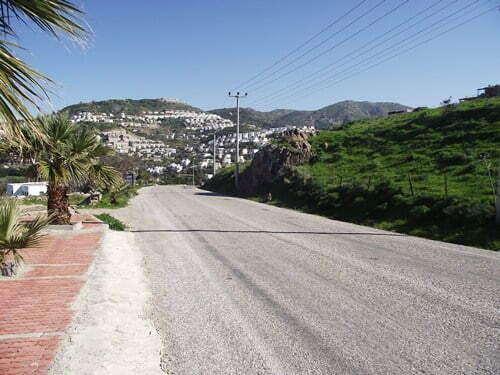 It is a lovely village and so different from many other places within Turkey. Thank you Natalie. I really enjoyed your photo essay. We vacationed in Turkey last June and simply loved Gumusluk. It was certainly a refreshing respite from the Bodrum tourist scene and a stark contrast from the bustling Turgetreis Saturday bazaar we had been to earlier that day. I was honored to be able to visit with jeweler Cavide Gözkara & her sculptor husband Akin Yükseler of Atelye Bodrum, now our friends on Facebook. Very interesting way of describing it by two face and I agree how it may be tourists one one side and one is more local feel. Love that boat shot, remind me of a lake in Up state New York. No problem Linda. Glad to share as it was a fantastic time. Beautiful photos Natalie…thankyou for sharing these and proving to me that very little has changed since we lived in Gumusluk about 12 years ago. I am determined to get over there for a day at the earliest opportunity!